Garba S, Ahmed A, Mai A, Makama G, Odigie V. Proliferations of scientific medical journals: A burden or a blessing. OMJ Oct 2010 ; 25(4):311-314. Scientific Medical Journal publication is rapidly increasing in volume. It has become the most explosive field of journal publications worldwide. Medical practitioners require proven strategies to benefit from these immense publications to keep up with current literatures. The task of teaching physicians to review medical literature critically has assumed increasing importance. The objective of this write up is to offer suggestions to help physicians improve their use of Scientific Medical Journals in their practice so as to be able to sieve out worthless journal articles. Majority of the articles agreed that a quick review of the title, the introduction and the abstract of an article will guide a physician as to whether to continue to read or discard an article. A strategy is required in reading an article so as to benefit maximally from it. In general, a quick scanning of the title, abstract, introduction, and conclusion sequentially usually will enable the reader to identify whether articles with interesting titles are truly of interest. If so, more time can be spent on methodology, results and discussion sections. As you read, always bear in mind the possibility of applying the study in your practice. The use of Medical Journals as a form of medical education and sharing of information consistently ranks above the use of other sources of literature such as Newsletters, Textbooks, and Monographs. It serves as a means of continuing medical education better than other methods such as personal contact with colleagues, making clinical rounds, and continuing education courses.1-6 However, most programs do not prepare doctors for critical review of literature. Publications of Scientific Medical Journals started in the early 1600s. It has since then rapidly increased in volume representing the most explosive field of journal publications worldwide.4,5 New medical articles are appearing at a rate of at least one every 26 seconds,4,7,8 and if a physician were to read every medical journal published they would need to read 5000 articles per day.9,10 It is therefore impossible for anyone to have a complete coverage of available medical articles.4,7,11 Physicians must therefore be able to separate the wheat from the chaff in this era of “information jungle.” The objective of this article is to consider the strategies involved in journal reading skills which will enable all practicing physicians to derive maximum benefit from medical journal education. This write up was prepared using different sources. Data sources included Literatures searched from the National Library of Medicine’s online database and Google scholars. All articles were traced to their primary sources through available websites. The retrieved data was saved in a Citation Manager (Reference Manager 12) for processing of the retrieved information. Physicians should formulate a personalized journal reading list and ensure they have access to the key articles in their chosen fields. The syndrome of “publish-or-perish” rules have brought many junk journals into the circulation hence the need to be trained in the use of medical journal reading habit to ensure maximal benefit. Some journals are floated for purpose of promotion and they disappear from circulation after the aims have been achieved. If a doctor is looking for a high yield journal for information, there are guidelines that must be followed. Articles are chosen for their clinical and methodological relevance. It is pertinent to say that an article should not be judged by the journal in which it is published. A useless article may appear in a well respected journal and a good article in a relatively unknown journal. However, physicians are advised to select high-yield journals for regular reading and continue to add relevant ones to their list of Journal armamentarium. Do not jettison everything published and consider only the weaknesses of a study. Doctors should know that there is no such thing as a perfect article.9,10,19,20 Always scan an article for technical complexity; if the technical complexity of the article far exceeds your ability to comprehend it, quickly discard it and move ahead. Journal Articles are broadly grouped into four categories: Editorials, Clinical reviews, Education and debate and papers. Physicians’ reading areas should embrace all the four categories.21 Your reading material should reflect the purpose of reading. A doctor will either be reading to find a specific solution to a clinical problem or to keep abreast of medical advance. In every good journal, every study has a purpose. The purpose of the article must satisfy your reason for reading the journal. The purpose of a published article or study can be found by reading the Introduction, Methods and the first paragraph of the Discussion.3,7,19,22-24 This triad will give the direction of the journal article and whether it is worth spending time on. Sometimes doctors come across bizarre cases in unfamiliar grounds. What steps should they take? When a Physician comes across an unusual disease about which he or she needs specific information, scanning a textbook followed by reading a quality review article is an excellent approach. This process may be followed by scanning articles from “how to” journals such as Patient Care journals to identify practical insights. Finally, scanning original research articles will identify recent advances in the subject being considered. Original reports are first-hand accounts of planned investigations and their results. One should read only original articles that have direct bearing on his own clinical practice. In contrast, when a Physician is reading to keep abreast generally, he should include a few good review articles as they recently appear and scan reports of original research articles. These guidelines will help all doctors to formulate what articles to read in order to maximise time spent on journal reading. Having selected a high yield article to read, there are further steps to take in reading the articles. A doctor cannot read all the available and relevant articles in his career. One of the major objectives for reading the medical literature is to develop clinical competence; this task is accomplished through efficiently extracting from the literature properly validated advances in medical knowledge of direct relevance to the physicians’ own practice. Physicians can derive immense satisfaction from keeping abreast of new developments in patient care by regularly scanning medical journal literature. Physicians must be learners throughout their careers and the learning must be self-directed, active and independent. The best way to reach this goal is to devote regular time to medical literature at least 30 minutes to one hour per day. However as the great volume of journal literature precludes physicians from reading all of it, special tactics of scanning, selecting and reading medical articles are necessary. 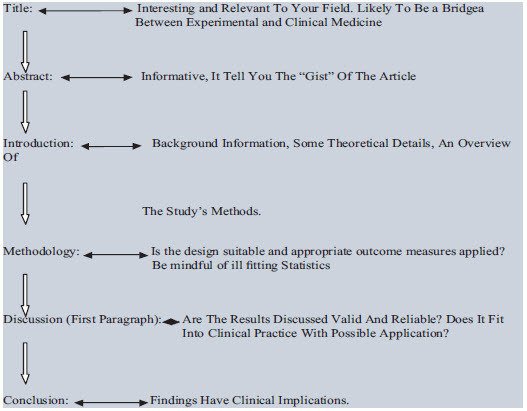 Figure 1: A Quick Guide for Selecting an Article for Further Reading. Physicians should begin reading an article by looking at the Title of the article to determine general interest. If the title of the article is not interesting or appears not to be relevant to your practice, please abandon the article. Next, verify the article’s relevance by reading the Summary or the Abstract. A high-quality structured abstract is a good outline of a study. An abstract will enable you to have a bird’s eye view of the study. It is informative and should be able to stand apart from the article, but should not be used as the sole basis for a critical opinion of the study’s validity. 7,23,25,26 You must ask yourself a very valuable question when you go through a journal article. Examine to see that even if the article’s findings are true, and whether it is useful in clinical practice? Can it lead to a change of clinical practice? Is it of practical use for the reader, given his or her peculiar practice setting and peculiar patients especially in an African setting? Physicians should endeavor to know more than elementary descriptive statistics as greater than 42% of journals use statistical methods beyond elementary descriptive statistics. Critical reading of medical literature requires an understanding of many statistical methods.27 The main objective of reading an article is to increase knowledge which may change or improve clinical practice. Applicability of any study is summarized in two words; validity and reliability. Reliability is the degree of consistency between repeated measures of the same thing. If the study was repeated, would the same data be obtained? Validity is the degree to which a study achieves the aim for which it was designed; does it represent the truth? Of the two concepts, validity is the most important but the most difficult to assess and above all the more subjective of the two. The two measures, validity and reliability are not mutually exclusive.7,23,25,26 A study’s findings may be very reliable yet invalid. With the rapidity of increase in medical knowledge, physicians will have to rely heavily on medical journals to increase knowledge and improve medical competence. Reputable journals are to be selected for regular readings. Most doctors cannot read critically and some lack the knowledge in biostatistics needed to interpret many of the results in published clinical research. Teaching programs should include more effective biostatistics training in medical curricular to successfully prepare doctors for this important all-time learning skill. Most biostatistical education occurs in the pre-clinical years of medical school and the intensity of training varies dramatically among institutions. It is the responsibility of individual physician to become competent not only in clinical practice, but also competent consumers of the medical literature. Effective strategies for journal reading should be developed by each medical practitioner so that current literature can be critically reviewed. Jme A. The role of a general medical journal. [Review]. BMJ 2004; 328:591. Chalmers I, Trohler U. Helping Physicians To Keep Abreast of the Medical Literature: Medical and Philosophical Commentaries, 1773-1795. Ann Intern Med 2000; 133:238-243. Gross JBM: Studying a Study and Testing a Test. How to Read the Medical Literature. Anesthesiology 1991; 75:1128. Linzer M, Mercando A, Hupart KH. Role of a medical journal club in residency training. Journal of Medical Education 1986; 61:471-473. Linzer M, DeLong ER, Hupart KH. A comparison of two formats for teaching critical reading skills in a medical journal club. Journal of Medical Education 1987; 62:690-692. Novack L, Jotkowitz A, Knyazer B, Novack V. Evidence-based medicine: assessment of knowledge of basic epidemiological and research methods among medical doctors. Postgraduate Medical Journal 2006; 82:817-822. Gehlbach SH, Bobula JA, Dickinson JC. Teaching residents to read the medical literature. Journal of Medical Education 1980; 55:362-365. Maize JCM. How a Medical Journal Comes About: Goals, Attainments, and Aspirations. American Journal of Dermatopathology 1986; 8:1. Neely JG, Hartman JM, Wallace MS. Building the Powerful 10-Minute Office Visit: Part II. Beginning a CriticalLiterature Review. The Laryngoscope 2001; 111:70-76. MEDICINE (1922-): Biography of a Medical Journal. [Article]: Medicine 1985; 64:217-218. Brown AF: Why buy a medical journal? Emergency Medicine Australasia 2004; 16:1-3. Guyatt GHM, Sinclair JM, Cook DJM, Glasziou PMBP. Users’ Guides to the Medical Literature: XVI. How to Use a Treatment Recommendation. JAMA 1999; 281:1836-1843. Linzer M, Brown JT, Frazier LM, DeLong ER, Siegel WC. Impact of a Medical Journal Club on House-Staff Reading Habits, Knowledge, and Critical Appraisal Skills: A Randomized Controlled Trial. Survey of Anesthesiology 1989; 3:137. Rockoff SDME-C. The Medical Journal as a Clinical Research Tool. [Editorial]. Investigative Radiology 1973; 8:96. Saint S, Christakis DA, Saha S, Elmore JG, Welsh DE, Baker P, et al. Journal Reading Habits of Internists. J Gen Intern Med 2000; 15:881-884. Stephenson LWM. John W. Kirklin. Reminiscences of a Surgical Resident. Journal of Cardiac Surgery 2004;19:367-374. Riegelman RK. Effects of teaching first-year medical students skills to read medical literature. Journal of Medical Education 1986; 61:454-460. McCall JW, Culpepper L. How to read medical journals; in Robert E.Rakel MD, (ed): Essentials of Family Practice. Harcourt Brace Jovanovich, W.B. Saunders Company, 1993. p. 194-204. Lin AEM. Writing for Scientific Publication. Tips for Getting Started. Clinical Pediatrics 2006; 45:295-300. Cunningham R. Classification for Medical Literature. Southern Medical Journal 1959; 52:112-122. Chalmers IF, Trohler UM. Helping Physicians To Keep Abreast of the Medical Literature: Medical and Philosophical Commentaries, 1773-1795. Ann Intern Med 2000;133:238-243. John M.Yancey P. Ten rules for reading clinical research reports. Am J Surg 1990; 159:533-539. Oxman AD, Sackett DL, Guyatt GH. Users’ Guides to the Medical Literature: I. How to Get Started. JAMA 1993 Nov; 270(17):2093-2095270:2093-2095. Groves T. How honest can a medical journal be? Australian & New Zealand Journal of Obstetrics & Gynaecology 2006; 46:2-3. Landers SJ. Study focuses on publication bias in journals. American Medical News 2008; 51:42. Bjorheim J, Frich JC, Gjersvik P, Jacobsen G, Swensen E. [Tidsskriftet, peer review and medical publishing]. Tidsskrift for Den Norske Laegeforening 2006; 126(1):20-23. Doublet-Stewart Mpgp. How political should a general medical journal be? : Politics are part of general medical journal. BMJ 2003; 326:821.